A variant of the classic French dessert Poire Belle-Hélène, adapted here for a Breton crêpe. To prepare the poached pears, peel the pears, cut in half and core. In a saucepan, combine the wine, sugar, orange, vanilla, cinnamon and honey. Bring to a boil. Add the pears and cook for 20 minutes over low heat. Remove from heat and let cool, covered. To make the caramelized almonds, cook the sugar in a heavy saucepan over a medium heat until the sugar thickens to a rich brown caramel. Add the almonds, stirring to coat. Remove from heat and cool. Break up the hardened caramel almonds and set aside. To prepare the chocolate sauce, in a saucepan, combine the chocolate and milk. Heat on low, stirring occasionally until smooth. Keep warm. Spread the batter onto the heated billig [or a large, non-stick frying pan] and cook until done. Fold the crêpe into a triangle and transfer to a plate. Spoon some chocolate sauce over the crêpe. Top with a poached pear and sprinkle with caramelized almonds. 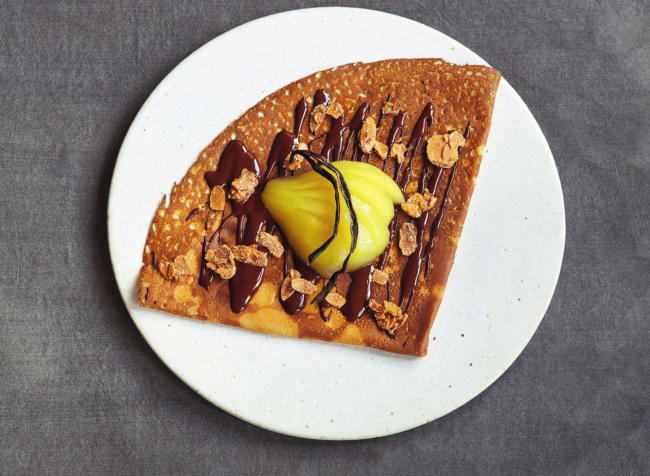 Taken from the book ‘Crêpes and Galettes from the Breizh Café’ by Bertrand Larcher – Originally published in the FrenchEntrée Magazine.